QUẢNG NINH — Dozens of fish were found dead in four detention basins in the past few weeks in the coastal province of Quảng Ninh, emanating a stench. 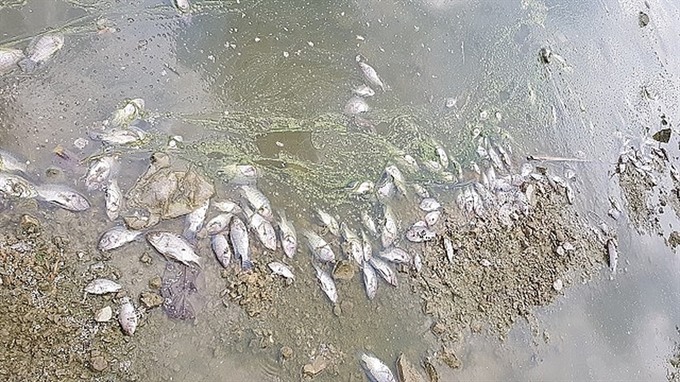 The dead fish washed up on the sides of four detention basins in Bãi Cháy and Hùng Thắng wards in Hạ Long City, the Pháp luật & Xã hội (Law & Society) newspaper reported. Water in the basins had turned black, and green scum was found floating near the dead fish. According to local residents in the two wards, the mass fish deaths have been a recurring phenomenon in the basins for a couple of years. “Around 9-10am on warm days, dozens of tilapia would wash up near the banks of the basins,” said a resident in Bãi Cháy Ward. City authorities have made efforts to clean the basin, but that has been ineffective in stopping the fish deaths, said Khổng Hưng, a resident in Hùng Thắng Ward. “Domestic wastewater as well as wastewater from construction sites and apartment complexes continue to be released from dozens of discharge culverts into the basins,” he told Tiền Phong (Vanguard) newspaper. All the four basins are connected with one another and are located in residential areas. One of them is connected to Hạ Long Bay, raising concerns that wastewater might flow into the bay from the basin. The condition of the basins has been brought to the attention of the city authorities. “We have assigned personnel to take the dead fish out of the basins,” said Hoàng Quang Hải, vice chairman of Hạ Long People’s Committee.